You're reading a sample of this book. Get the full version here. 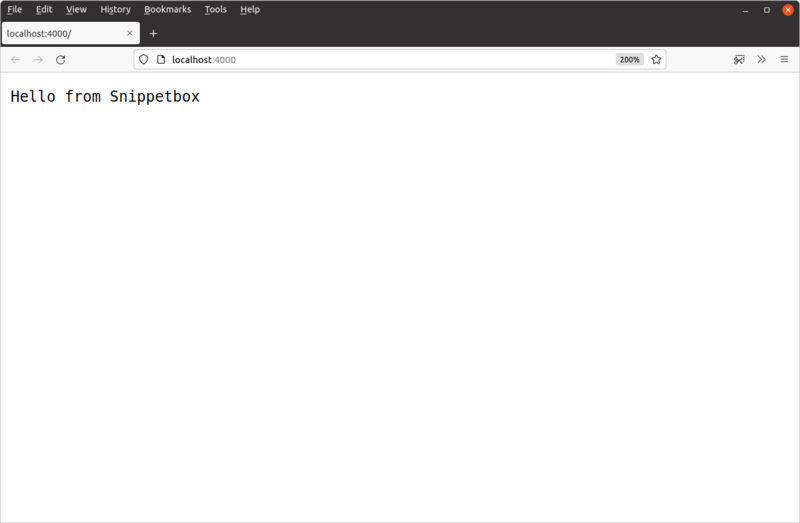 Before we write any code, you’ll need to create a snippetbox directory on your computer to act as the top-level ‘home’ for this project. All the Go code we write throughout the book will live in here, along with other project-specific assets like HTML templates and CSS files. But where exactly should you create this project directory on your computer? GOGCCFLAGS="-fPIC -m64 -pthread -fmessage-length=0 -fdebug-prefix-map=/tmp/go-build156985703=/tmp/go-build -gno-record-gcc-switches"
The important thing to look at here is the GOPATH value — which in my case is the directory /home/alex/go. Although you can create your project directory anywhere on your computer, if you plan to use modules to manage your dependecies — like we will be in this book — it’s simplest to locate your project directory outside of your GOPATH directory. Note: This is a big change from old versions of Go (pre-1.11), where it was best practice to locate your project directories within a src folder under your GOPATH directory. So, if you’re following along, open your terminal and create a new project directory called snippetbox anywhere on your computer so long as it is not under your GOPATH directory. I’m going to locate my project directory under $HOME/code, but you can choose a different location if you wish. The next thing we need to do is let Go know that we want to use the new modules functionality to help manage (and version control) any third-party packages that our project imports. To do this we first need to decide what the module path for our project should be. The important thing here is uniqueness. To avoid potential import conflicts with other people’s packages or the standard library in the future, you want to choose a module path that is globally unique and unlikely to be used by anything else. In the Go community, a common convention is to namespace your module paths by basing them on a URL that you own. In my case a clear, succinct and unlikely-to-be-used-by-anything-else module path for this project would be alexedwards.net/snippetbox, and we’ll use this throughout the rest of the book. If possible, you should swap this for something that’s unique to you instead. Now that we’ve decided a unique module path let’s enable modules for the project. At this point your project directory should look a bit like the screenshot below. Notice the go.mod file which has been created? Later in our build we’ll see how this file is used to define the third-party packages (and their versions) which are required by our project. If you’re creating a package or application which can be downloaded and used by other people and programs, then it’s good practice for your module path to equal the location that the code can be downloaded from. For instance, if your package is hosted at https://github.com/foo/bar then the module path for the project should be github.com/foo/bar.